It’s our pleasure to share news from the months of May and June, focusing on outreach within the Global Alliance for Green and Gender Action (GAGGA) program. Through its Training Centers, IAFN has reached out to partners in 11 countries -Togo, Benin, Ghana, Cameroon, Uganda, Bolivia, Sri Lanka, Nicaragua, Costa Rica, Guatemala and Honduras. Our goal: To improve livelihood conditions for rural women by sharing knowledge on Analog Forestry, facilitating discussions on environmental justice issues close to their hearts, to then connect with stakeholders and policy makers, to enact changes that promote a clean, healthy and safe environment. Since our last newsletter, where we informed of workshops in Togo, Nicaragua, Costa Rica and progress with kitchen gardens in Honduras, our partner CENDEP in Cameroon has actively been engaged in trainings with women in Benin and soon, Ghana and Uganda. In Central America, IAFN´s coordinator for Lobby & Advocacy, has recently returned from an inspiring gathering of women in Guatemala which we share with you below. In South America, our Bolivian Training Center invited IAFN trainers to join a workshop in Paraguay and in Bolivia, several workshops are coming up as well. A special thanks to BothEnds, who provide support to work with these wonderful new partners. 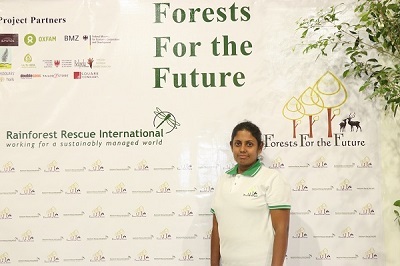 We are welcoming, Lakshi Dilhari, as our new GAGGA project coordinator in Sri Lanka. We held a short interview with her on topics of environmental issues and women`s rights. How can initiatives like GAGGA & IAFN benefit women in Sri Lanka? Till this moment, in the northern part of Sri Lanka, 150 widows have joined into the GAGGA & IAFN projects, implemented by Rainforest Rescue International to spread the knowledge of Analog Forestry. Women organizations that are involved in AF earn a considerable amount of income to increase the quality of their livelihoods. On the other hand, some women have started to monitor their AF activities and share their knowledge with other members. Therefore, their social status has been increased. What is, in your opinion, the biggest obstacle for women in Sri Lanka? In Sri Lanka, women are not given the recognition or necessary power to address certain issues. However, there are certain advantages of chivalry where a man will go out of his way to assist a female. So the issue isn’t as clear cut.Do you feel supported by the government and other stakeholders for your initiatives and AF work in Sri Lanka? The Sri Lankan government is only on a small scale involved in AF. However, other organizations such as Universities and public schools are interested in AF. They have participated in several workshops organized by the Belipola research centre. Moreover the Ministry of Environment is willing to link their activities with our AF activities. 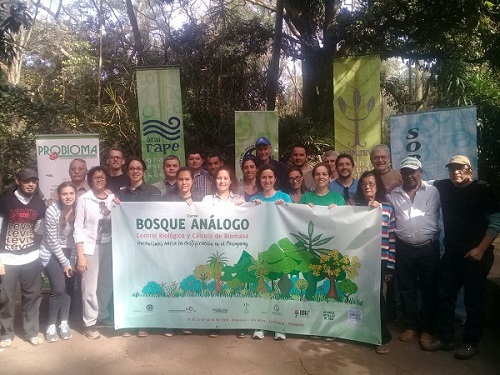 PROBIOMA, our partner and home to IAFN´s South American Training Center in Bolivia, has opened up new opportunities to spread the knowledge on Analog Forestry in neighboring Paraguay. 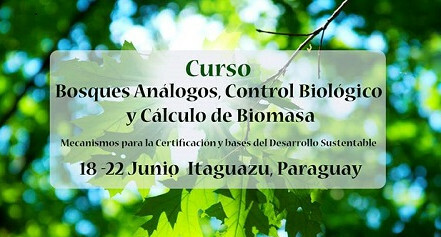 Thanks to the organizationSOBREVIVENCIA– Friends of the Earth, a five day course from June 18th to 22nd on Analog Forestry, Biological Control and Biomass calculation was held in the town of Itaguazu. 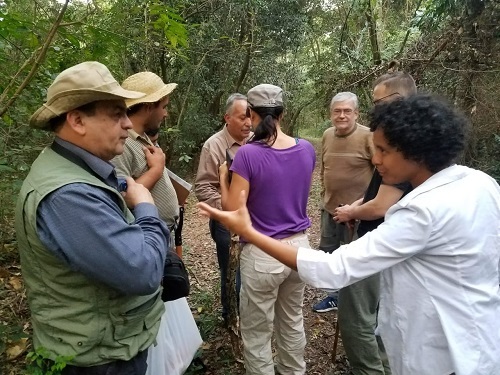 AF Trainers Miguel Crespo (Bolivia), Milo Bekins (Costa Rica) and Tatiana Espinoza(Peru), were joined by Carolina Sorzano (Colombia) working as a team with the Bolivian Institute of Forestry (IBIF). Happy to announce that SOBREVIVENCIA will soon form part of our global network! Within the GAGGA Alliance, our partnerPROBIOMA is preparing workshops involving women in five communities in San Ignacio de Velasco, a municipality of Chiquitania in the Pantanal area of Bolivia to whom they will be helping to establish community tree nurseries. The local municipality is involved in the outreach and follow up with these women. We look forward to soon report on advances made by PROBIOTEC regarding the implementation of their demonstration site for Analog Forestry. 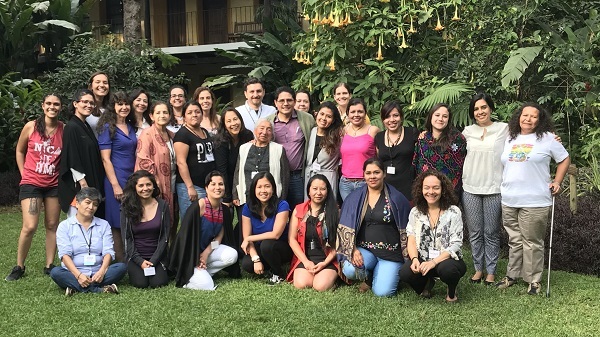 This June, we had the opportunity to participate in an inspiring midterm evaluation of the Global Alliance for Green and Gender Action in Guatemala. Powerful, strong and green women from GAGGA partner organizations, funds and grassroots groups in Latin America discussed key learnings and challenges from the past 2.5 years. One of the key achievements in GAGGA is a Joint Position from GAGGA partners in South America called “Women, We are Water” which calls for protection of ecosystems against the pressure from global capital through imposition of mega infrastructure and energy projects of extractive models and for common work for sustainable and participatory management of the ecosystems. The techniques of Analog Forestry play a critical role in shifting the paradigm of rural development to ensure ecosystem and soil restoration and full participation of women in decision making. What have we learnt? Learning and trust-building process is essential for tackling complex problems such as human rights abuses, food insecurity, climate change, land grabbing, monoculture plantations and other global challenges. Together we can strengthen our abilities to influence decision-makers at the local, national and international levels and build stronger lobby and advocacy strategies to sustain our planet’s life support system. 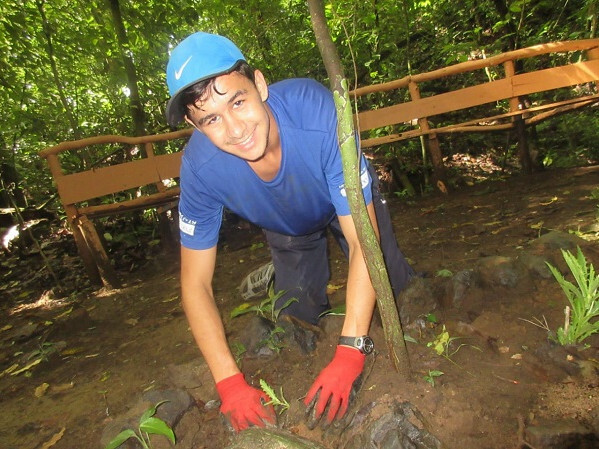 A group of Canadian volunteers, from the organization Mer et Monde helped to plant native trees in IAFN’s Costa Rican AF Training Center, the El Toledo Agroecological Reserve in Hojancha, Guanacaste province. The AF site is located in an old timber monoculture plantation, an area that spans 6 hectares which is being transformed into a food forest for animals and humans alike. Alongside the tree planting, the volunteers organized an environmental education workshop with children from the public school nearby. Through a theater presentation, they explained the urgent problem of deforestation to the kids, and solutions, such as planting trees, letting the audience know that it only takes one person to make a change. 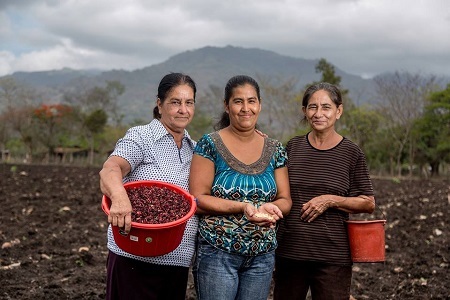 The IAFN is establishing a new collaborationwith the Nicaraguan organization Foundation Among Women (Fundación entre Mujeres, FEM) which focuses on empowering women farmers and helping them to implement strategies to face climate change. One of the actions of FEM, who are partners in the GAGGA alliance, is to purchase land in which women of the surrounding communities can plant and sell their organic products. 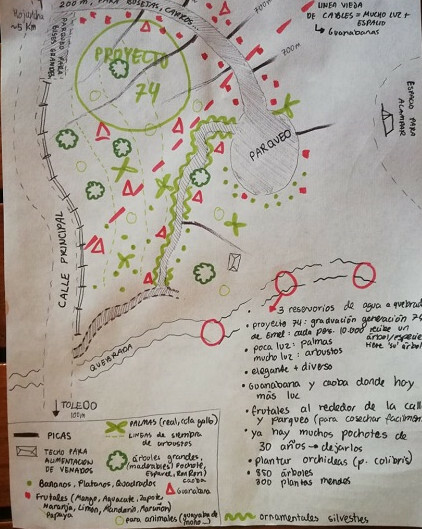 The current political situation has delayed plans for the moment, however we are planning a four day AF workshop with FEM, close to Estelí, in the upcoming month. The objective is to broaden the knowledge of FEM partners on restoration methodologies and to help them apply AF designs on their land. 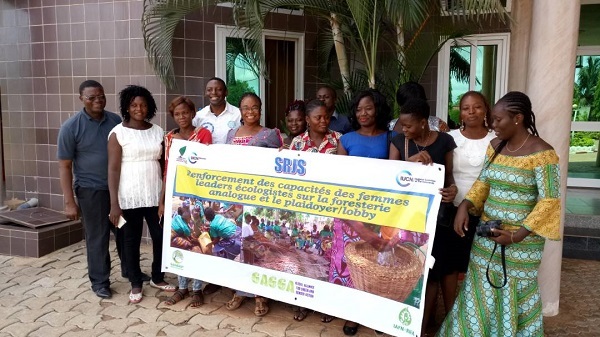 Between May 23-25, the Center for Nursery Development and Propagation (CENDEP) and local organization Nature Tropicale organized an Analog Forestry and Lobby & Advocacy Training for ecological women leaders in Dangbo, Benin. 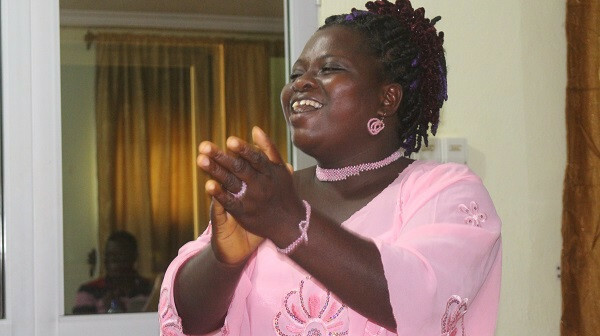 Fourteen women from different locations in southern Benin and several local authorities from the lower valley of Ouémé attended. The women developed concrete action plans to work on possible solutions to problems regarding the right to water, forest management, land rights and food security, while the local authorities firmly committed to support them in their actions for the environment. The women recognized the need to acquire in depth knowledge on Analog Forestry, to organize participatory reforestation plans, implement tree nurseries to protect their surrounding biodiversity, and are asking for more AF workshops in the following months.